I finally got around cleaning the contacts on my Vectrex game system and cartridges, which had gotten glitchy due to 30+ years of oxidation. I wet some paper towel with rubbing alcohol, wrapped it around a thin piece of cardboard from the back of a notepad, and pushed it between the contacts inside cartridge slot. The cartridges themselves were much easier; I just used rubbing alcohol on cotton swabs for that. I tested the first cartridge I cleaned (Bedlam) and it worked perfectly; previously I had to prop it up with a stack of magazines to make good contact. Success! I also found the Minestorm screen overlay, which I thought I had lost. It was hiding in the bag with all the game boxes. 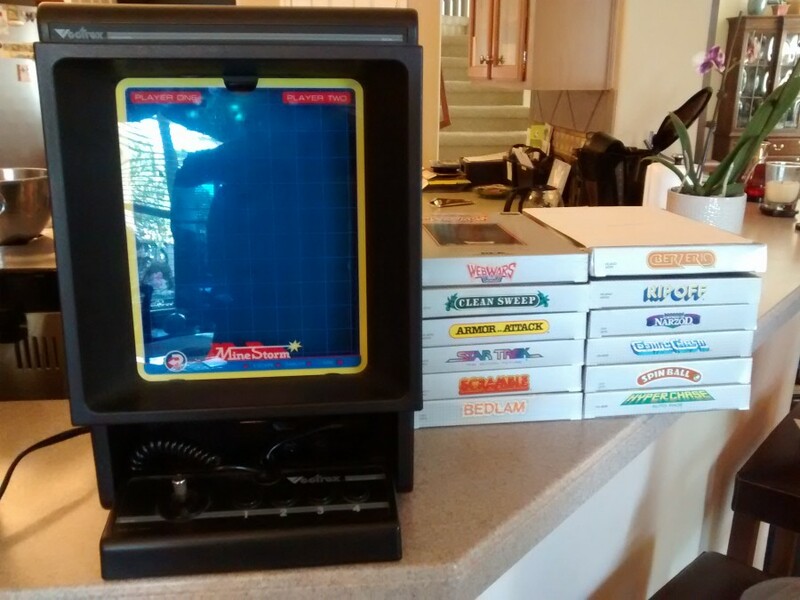 The Vectrex wasn't all that common; its life got cut short by the video game crash in late 1983. I didn't know about that at the time. It was just a cool thing I got on clearance from Lionel PlayWorld in 1984, when I was nearly 11. I got a few other games for it from various places trying to get rid of them and regretted turning down a couple opportunities to get more. I didn't have to clean the system itself; I keep it in its original box so it never got dirty. It's just that the contacts had oxidized enough over 30 years to become unreliable. The game boxes are in relatively good shape except for a couple that have a bit of what looks like superficial water damage and the Berzerk box which is missing its tray and got smooshed a little. Basically, they were indirect casualties of the flooding.